In the difference to a surf set global options of the WebAssistant are set here. Displays the corresponding description at the browser. Note: If the description isn't displayed, then you enter the browser in Options/General/Browser. Adjust options are taken permanently. At the next start, the adjust options are used again. The dialog is closed. Adjust options are taken temporarily. Changes are not taken. The dialog is closed. Comprehensive options are summarized in the category general. The activities of the WebAssistant can be logged. Not available resources can be collected in a list at first. The WebAssistant communicates with the browser via a port. The port 8080 is used on your local computer (IP address 127.0.0.1) by default. Setting is taken at the next start of the WebAssistant! The address of the computer can be changed. Only the computer has access on which the WebAssistant runs. You can set further computers. You can specify which browser shows additional information of WebAssistant (Homepage, Help, Update/News, Contact). Usually, this entry is not necessary because your standard browser is used. Furthermore you can specify, whether the WebAssistant shall start the browser as well as used start page. You can select between English and German. In the user interface both languages are available. Documentation is however available in the delivered ZIP-archive only in one language. The main menu is on the desktop per default. The main menu can alternatively be operated about the tray icon symbol in the notification area of the taskbar. The changed settings are available at the next start of the WebAssistant. You can operate the WebAssistant also about your browser. With your browser you can in addition navigate with the command ls in the directory structure of the cache archive now. 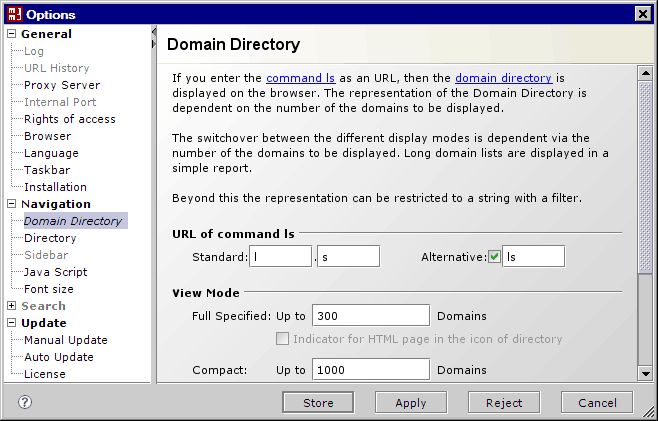 Enter the URL http://l.s in the address bar of your browser to display the Domain Directory. You also can rename this URL. The representation of the Domain Directory is dependent on the number of the domains to be displayed. The switchover between the different display modes is dependent via the number of the domains to be displayed. The visualization is made out per domain in a line. If only one entry exists for a domain, then the Full Specified Domain is displayed. Visualization is made out per domain in a line. Beyond this the representation can be restricted to a string with a filter. Indicator shows available HTML page in sub-directories. The term Domain is used as short name for Secondary-Level Domain. We otherwise describe this as a full specified Domain. At this we assume per default the protocol HTTP. The HTML files are listed with their title and description as well as approx. 200 characters text. Indicator shows available HTML files in sub-directories. Pages for navigation can be displayed on the browser with and without java script. With java script more action is available. You can select the smallest font size at pages for navigation. A search function is available in this edition. Result of a search is displayed as a hitlist. The files (pages) are listed with their URL, size, date of archiving as well as 200 characters. Search words can be marked in the page. Statistics of the indexed words, domains and HTML files are displayed. With this option you can actualize the WebAssistant. Version of the WebAssistant is viewed. You can in addition import a new license here. Checks whether a new version of WebAssistant exists. Download the new version. At the next start of the WebAssistant the new version is used. Checks, if there is a new version available monthly.